Pokemon Go has added a surprise for trainers - a new type of hat-wearing Pikachu. Earlier today, Pokemon Go surprised fans by adding a new type of Pikachu outfit, a baseball cap with two thunderbolts on it. No explanation has been given for the new Pikachu variant, but the game also added a matching shirt and hat for trainers to wear with their new Pikachu. The new Pikachu is actually a tie-in with a new line of "Thunderbolt Project" streetwear being released tomorrow at HypeFest in New York City. The clothing company Fragment is releasing a line of Pokemon-themed outfits to wear, which include real-life versions of both the hat and t-shirts. The new apparel will go on wider release starting in 2019. The new stylish Pikachu was added basically without warning. Players first discovered the Pikachu variants appearing in the game's network traffic shortly after the start of the Psychic-Type event and appeared in the wild a few days later. Outfit wearing Pikachu is one of the oldest traditions in Pokemon Go, dating back to Christmas 2016. This is the sixth different outfit added to Pokemon Go, joining the Ash Hat Pikachu, Party Hat Pikachu, Summer Style Pikachu, Witch Hat Pikachu, and Holiday Hat Pikachu. Pokemon Go also released a Squirtle Squad variant of Squirtle earlier this summer. The new outfit shows a surprising amount of synergy between different business partners of The Pokemon Company. We've seen Pokemon Go used to promote Pokemon events and movies, but we haven't seen the game used to promote a Pokemon-related product made by a third company. 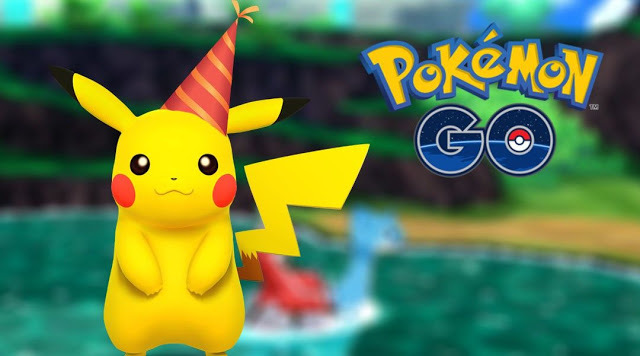 This is a pretty big surprise for Pokemon Go fans and gives players another thing to search for in addition to the various perks of the ongoing Psychic-Type event. Let us know if you found one of these hat-wearing Pikachu in the comment section below!